Location: The port of Varna is situated on the S side of the city within Varnensko Ezero (Devno) and Gebedzhensko Ezero, 2 lakes which lie W of Varna connected to the sea by channels. General overview: Varna is divided into two main parts, Varna East on the Black Sea which specialises in general cargo and passengers, and Varna West, 21km inland on a large natural lake, which handles bulk cargoes. Sea buoys, fairways and channels: From the vicinity of the Traffic Seperation Scheme, centered Lat 43°11N, Long 028°00E or anchorage area No 1, close NW, the final approach to the port of Varna leads generally W of the buoyed fairway channel. This fairway passes S of the breakwater marked at its S extremity by Varna lighthouse, (white round tower, 9m in height) and leads to the entrance of Varna East Harbour, which is marked by lights (white round metal towers) and to the entrance of channel No 1, which is marked by a lightbuoy and a light beacon. 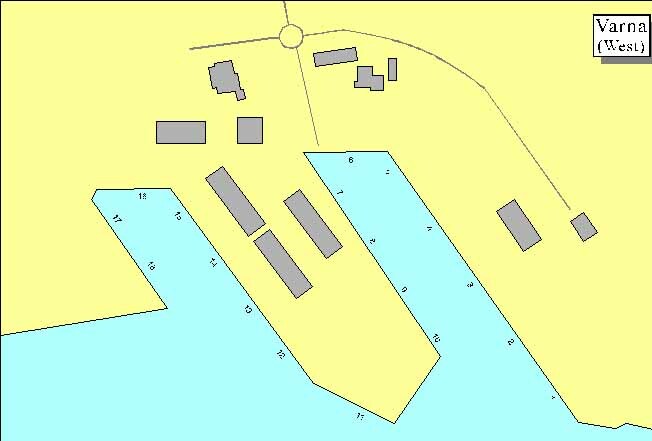 Anchorages: An anchorage area lies close NW of the traffic roundabout, centred, Lat 43°11N, Long 028°00E. Charts: 2285, 2230. Admiralty Pilot NP24. Restrictions: Navigation is forbidden when visibility is less than 500m. Navigation in channels No 1 and 2 is one way. The max speed permitted in these channels is 6kn. 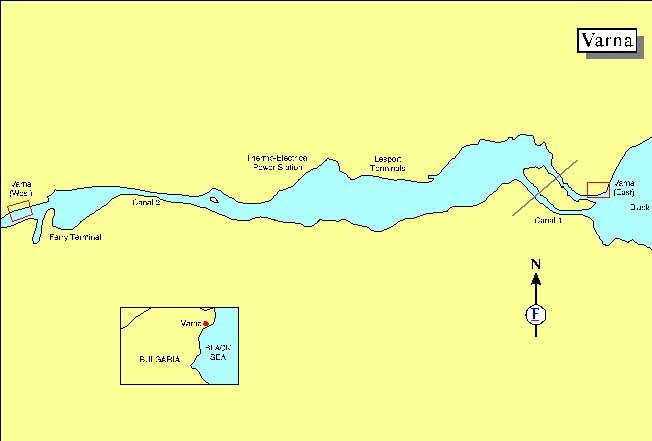 Canal Road, Varna West: Air draft, 41m; max draft; 9.0m; vessels over length 200m; breadth 26m and 20,000gt, pass the canal in daytime only. Channel proceeding to shiprepair, shipbuilding yard: Vessels over 12,000gt pass the channel in daytime only. Max draft 5.30m; trim 0.5m or less; wind speed 5m/sec or less. Tugs: Compulsory for all vessels over 1,000grt. Coal cargoes are sent to a terminal 6km W of the port, accessible by vessels drawing up to 9.5m. Varna West: The following berths have a draft of 8.8m, Nos 0, 2, 6, 11, 12, 13, 14, 15, 16 and 17. The following berths a have draft of 9.7m, Nos 1, 3, 4, 5, 7, 8, 9, and 10. 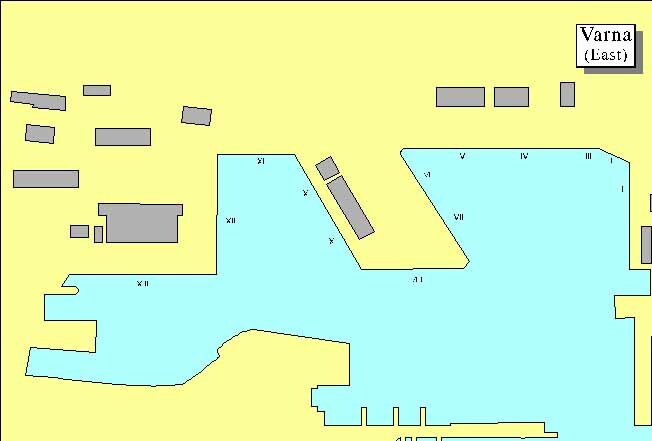 Container berths: One quay at Varna E, max depth 7m. Tanker berths: Two berths with a max draft of 9.14m. Ro-Ro berths: Facilities exist in Varna E.
Storage: Total warehouse capacity 30,000sq m at Varna East, 4,000sq m at Varna West. Docking facilities: Odessos Shiprepair Yard has one drydock and 2 floating docks together with 1,200m of piers, 8 x 16t cranes and a 100t floating crane. Transport: Nearest airport: Varna, 10km. Consuls: Cuba, Czech Repulic, Germany, Poland and Russia. Public holidays: Jan 1, May 1, 2, Day of Bulgarian Culture, Education and Slav Script (May 24), Sep 9, 10 and Anniversary of the Great October Revolution (Nov 7). Working hours: Shift work 0600-1400hrs, 1400-2200hrs and 2300-0600hrs.